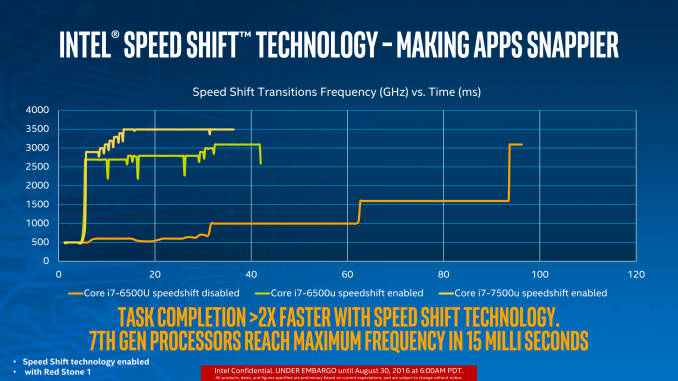 One of the big questions regarding the launch of Intel’s 7th Generation of CPUs was around what extra features the new platform brings, especially if there isn’t any clock-for-clock performance improvement. As with our other Kaby Lake reviews, here we explain the main two: Speed Shift v2 and Optane Memory support. Intel, as far as we can tell, is set to release two main classes of product: Optane DRAM to be pin-compatible with DDR4 and require Optane DRAM enabled processors, and Optane SSDs which should work with any PCIe storage interface. ‘Optane Memory’ however, is something a little different. 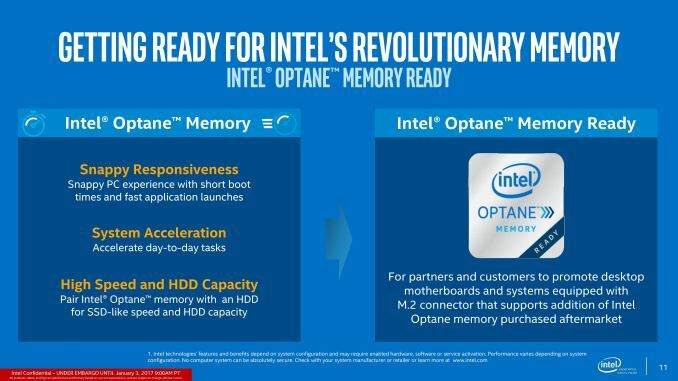 Based on pre-briefings, Optane Memory is certainly not Optane SSD we were told, but rather a storage cache for mechanical hard-drives. We’ve had this before with NAND flash drives, using Intel’s Rapid Storage Technology, and it seems that Kaby Lake and 200-series chipsets will support a new version of RST for PCIe based storage. 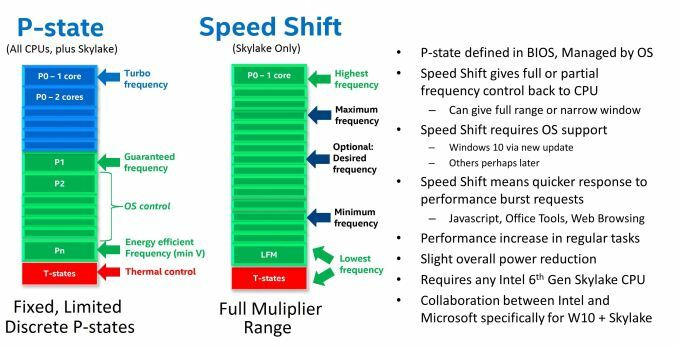 But because this is caching drive, such as the 16GB Optane Memory drives in Lenovo’s upcoming notebooks, and not Optane SSD, might lead us to believe that ‘Optane Memory’ drives are not designed to be directly user addressable. Absolutely should have included overclocking. Sandy Bridge chips had very conservative stock clocks and great overclocking potential. At the time you were almost guaranteed 4.4GHz-4.7GHz on air and and there were lucky users reaching 4.8-5GHz (and more under water). My 2600K has been running stable at 4.6GHz (a 35% overclock) for six years now at 1.35v. Those single-threaded charts would look much different if you included overclocks and the multi-threaded charts would seriously widen the gap. Yep! Sandy Bridge was/is good tech! I got the non-K i7 Sandy Bridge, and even that overclocked easy to 4.2GHz. It was an artificial limit, but I didn't need to spend the $50 premium to get a potential 3-500MHz out of it. Been humming along for 6 years now and hasn't missed a beat! Ya, not too useful on the gaming charts as even the non-K chips kept up with the GPUs just fine. But getting to see what it does for productivity tasks would be interesting. Too much individual variation. Non-overclocked performance is the guarantee. Everything else is up to chance in the silicon lottery.